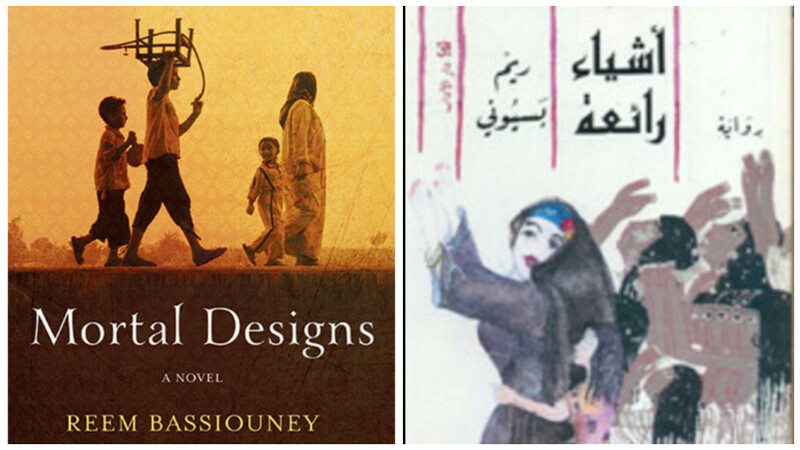 Mortal Designs is a beautiful translation of Reem Bassiouney’s Arabic novel (Ashiaa Raae’a). It is a love story born in the midst of all kinds of struggle; from social class and cultural differences, generation and gender clashes, power struggles and finally the dilemma of an internal struggle. Reem Bassiouney is an award-winning Egyptian novelist. She is a professor of sociolinguistics at the American University in Cairo, having taught at Cambridge, Oxford, and Utah. She writes widely on gender and linguistics. She has written several novels and a number of short stories and won the 2009 Sawiris Foundation Literary Prize for Young Writers for her novel Dr. Hanaa. The story is set in pre-revolution Egypt with plenty of reflections on previous eras in Egypt’s modern history. The two main characters, Asma and Hazim, though coming from completely different worlds, both claim to defy the norm and despise corruption, only to realize that they are contributors to it in their own way. Asma is a widow who has vowed to raise her three children on her own. She refuses to give in to the boundaries and low expectations set for her by her community in Benha. She fights to change her reality, determined to rise above her current status, no matter what it takes. She plans a detailed future for each of her children, and a place in history for her name, because she had changed the way people see women of her social class. Then she sets off to execute her plans, enduring all kinds of blows along the way. In the process meets Dr Hazim, an elite architect from a higher social strata who seeks immortality through his creations. Initialy, Hazim alienates Asma and merely feels pity for her situation. The architect has lived a luxurious life, keeping himself at a distance from everything and everyone around him. He believes in an Egypt he had created in his own head from the memory of his ‘good old days,’ and refuses to mingle with the public. But eventually his ivory tower crumbles as he faces his own demons. The worlds of those two polar characters collide in what they believe is mutual benefit, which turns out as much more than that. They find themselves changing daily, fighting with themselves, with their society, and with corruption. The other characters in the story are allegorical; representing different aspects of our society through vivid personas we meet every day. They play essential roles in shaping the destinies of Asma and Hazim, whether through directly impacting them or being the driver that makes them act one way or the other. The story open-ends in, what I believe, is a very realistic style. It is full of monologues, scenes and imagery that makes your mind wander and reflect on the world we live in.